In our third "ART ON THE NET" Exhibition, we are exploring the artistic possibilities of VRML, Virtual Reality Modeling Language. We received 70 VRML worlds - from over a dozen countries, and the board of jurors have selected Grand Prize, Silver Prize, and Bronze Prizes. 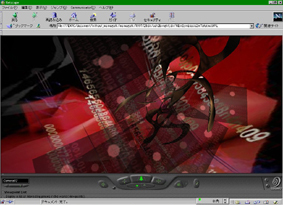 This "Art on the Net 1997" was produced by MCMOGATK (Machida CIty Museum of Graphic Arts, Tokyo), Art on the Net Exhibition Committee, in cooperated with NHK Engineering Service Foundation, Computer Graphics Art Society, Hi-Vision Promotion Center Japan, Digital Archives Association.